Need to add a section about aligning false permanent exterior non-hinged shutters that do not exactly match the window height. Also, slats up vs slats down. Read on – it’s there. Hello. We have a home in a historical district with old wooden one inch shutters. Shutters help conserve energy if they are working shutters and are closed during the winter. The louvers must also be closed tightly. For a 1928 house I would recommend a shutter with a cut-out. They can be half paneled or louvered but should have a cut-out. Your HPC probably doesn’t have a clue – unfortunately. You did a color job layout for us earlier this year. We are now in the process of choosing wooden shutters to replace the fake aluminum shutters that were nailed to the house in 1953. Our home was built in 1865 and we now have approval by the Historical Architectural Review Board to restore the original porch with the removal of the asbestos tiling and new wood shutter along with restoring the corbels. Based on your blog, it appears that the louvered shutters shown in the 1927 picture we sent may have been a later addition., What would you suggest as the appropriate types of shutters for our first and second floors. And would there have been shutters on the third floor stained glass window area? Hi Joanne – For me to check out your house I would need you to reply to one of my emails with the project number in the subject line. However for an 1865 house you should have operable louvered shutters. No shutters on stained glass windows though. This is a great educational piece. I also have a ranch with a long southern front porch. It has Centered door, 2 sets of sash windows on each side and shutters would certainly add character. It is not a historical house, but it actually looks like it needs something. I am assuming panel shutters would be a safe bet, or louvered because it is in the south. But I do love board and batten for the rustic appearance. Do you think it matters? Hi – for a ranch house any style shutter would work. I’d like to repaint my shutters, but I’m not sure what color to pick. We have a one story ranch with tan vinyl siding and a grey roof. I’m thinking black for the shutter colors. Do you think that’s a good idea? I just bought a little log cabin. It’s about 700 square feet. It is brown and I was wondering what color shutters I should put on the cabin, the cabin was built in 1940. Board and batten and paint them benjamin moore essex green. Already have the exterior louvered shutters on each side of entrance door on a townhouse which are the original close to 35 years. Want to add louvered shutters to a double window same front entrance. Would it really matter if the slats are slightly a different size (smaller). Color is “bronze” that looks like a deep color grey. It would be better if you emailed me with a photo. I would say they should be the same size. I have a two story colonial that we are in the process of residing. The top floor is siding in a dark grey and the lower level is white painted brick. There are 4 sets of 2 windows upstairs and downstairs there are two sets of long windows (livingroom/diningroom). The windows are all trimmed in white. I thought that I wanted shutters on all the front windows but now I am thinking of only putting them on the first floor, against the white painted brick. I would like your thoughts of putting shutters on all, or just first floor. I don’t recall seeing shutters on one level only, especially a traditional colonial with a straight front. This is a question that should be emailed to me with a photo. I would shutter all windows. I am in the midst of stripping and painting my shutters. Along with that I am planning on painting the window sashes. I would like to go with a red for both of these but am having a hard time finding the correct red color. Most seem to bright red and the first attempt doesn’t look great. Is there a red color that is traditional. Our house is a colonial revival built in the 1920s. Last question is what paint sheen is appropriate for shutters? Use gloss paint for shutters. As for red try Benjamin Moore Classic Burgundy or Sherwin Williams Rookwood Red which has a bit of brown in it. Our house is over 100 years old. The first floor on the front of the house has the original shutters. Would it look right if be put new vinyl where they are missing? If you can’t do it right don’t do it at all. 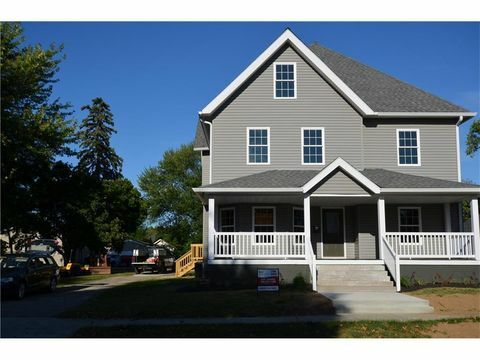 Hello, I have a newly remodeled Craftsman-style house with large casement windows. The frame of the windows (and inside of the flat casing) is 58.5” tall by 31.5” wide. I intend to install single framed board and batten shutters next to each of the windows. How large should the shutters be? I assume they should overlap the casing opening but not sure by how much. Also, it’s not a historic house—should I use hinges to install them or just screw them in place. Thanks much for the advice. 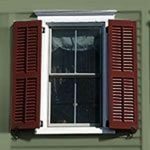 Hi – first of all you shouldn’t have shutters on casement windows. This is mostly because in the US the windows open outwards so how would you be able to close the shutters? Not that you are going to ever close your shutters but really you shouldn’t use them. 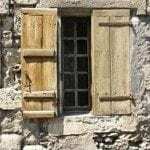 In Europe the windows open inward so they can use shutters. A double hung window has what is called a blind stop around the perimeter of the window. (refer to diagram on this page to see blind stop https://www.oldhouseguy.com/window-designs/) Storm windows and shutters both fit into the casing and rest on this blind stop. The shutters then fill the entire area inside the window casing. To measure you would measure the area from the inside of one side of the casing to the other. 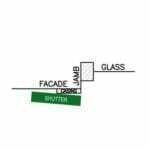 Casement windows do not have a blind stop but the area would still be between the casing. Additionally you need to use hinges for the right look otherwise they will just look flat. I still do not recommend shutters for your house though. Building a house with all brick front. It will have non operational shutters. Side loading garage on the right that has 2 single windows(with shutters) on 1st level and big arch on second(no shutters). Next section to left has double windows on both levels with shutters. Next section is entry that has big arched window(like 2nd level garage) with no shutters. Next section 3 window 1st level with shutters and 2 window second level with shutters. Last section on left has 2 single windows with shutters on 1st and 2nd level. 2. If I do those shutters on the window, they currently want to bolt the non operational shutters directly to the brick. I read that shutters shouldn’t be screwed directly to brick. So should I have them frame out the windows with brick turned a different way so that they can screw shutters to that trim brick to have them sit about .75”-1” off the brick? i know this is a bit off topic, but here goes. I have just bought a holiday home in Cape Town, South Africa, and need advice whether to purchase and install White Teak Shutters or Aluminium security shutters on the inside of the living room or outside on the patio? I am not a local (proudly residing in Boulder, Colorado!) and have been advised that is preferable to install the shutters inside for security purposes as they are harder to break into? Have been told crime is quite high there. The property is also a turn of the century cape Dutch style home. I was further advised that American shutters are by far the most reputable and best quality for Shutters in South Africa by the estate agent? Ken, Dan any advice would be appreciated. Hi Serge: When you are not there if the house is vacant and not rented out you will need to make security your priority. I don’t know what aluminum shutters look like – probably not attractive but that’s what I would recommend. I’m wondering what to do with a newer style window where it doesnt have a traditional wood casing to mount to. My windows all have a plastic j channel built In that my siding slides behind. In this situation is mounting directly to the house the only option?? Hi – can’t help you with this but maybe one of the readers can. the old shutters had been ripped off and destroyed but they left behind the original rat tail shutter dogs, any ideas on what to do here ??? Also a garage has been added, and the doors are terrible… what would be a good way to keep the garage but have it blend in or make more sense, barn style doors?? thanks, I am overwhelmed with desicions! Welcome to the world of historic home ownership! I would use paneled shutters. Board and Batten may be too crude for your house. Either paint the garage a stone color to match the stone house or a red, Benjamin Moore HC-65 Hadley Red to resemble an out-building or barn. Yes barn style door for sure. You can get real ones that slide or open out or doors that look like barn doors. Make sure they are wood because they will have sharper detailing. Good luck! I really want black shutters and a black door, but I feel like the shutters would only look right on the one second story windows. No shutters what so ever on any of the window. We are putting our house up for sale and our real estate agent asked us to put shutters on the front of the house. We don’t know where to start. We were thinking black, not sure if the attic window has enough space to accomadate shutters. Do we do the porch window as well? I Agree – your house does need shutters on the second floor. For the 3rd floor you will need to measure. Remember you must mount them on the casing so that gives you some extra space. I can’t see the bay window on the porch but you could skip that window. Black would be the best color. Good shutters are very expensive but will make a huge difference in selling the house. 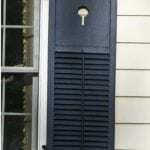 I am looking for vinyl non-operable shutters for my house. The front of the house has old style “orange” brick. I have a black-dark grey shingles on the roof. So, I was looking for a very dark grey colors shutters, but have no luck finding it. Also my existing dark green Mid-America shutters started to lose color after 5 years (House is facing SW with no tree shade). 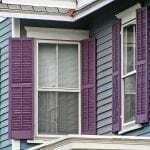 Any manufacturers that would have less color fading issues with their shutters? Thank you. Sorry Mike as you should have read, no shutters are better than cheap vinyl shutters. Hi! We have a plain two story farmhouse that needs shutters as soon as possible! It’s all white with a green metal roof.. I can’t decide if I should do forest green shutters on the 6 windows in the front? And I can’t choose between board and batten or louvard for the style.. also, would it look odd with shutters just on the front and none on the sides bc of the awkward window placement? we have replaced our side door with a stained wood door and would like to replace the front door eventually but if I do green shutters should I paint my front door the same green too? Off topic but after installing shutters to add color should I paint the porch railings white? Hi – your house must be all white. The shutters and the front door can be Benjamin Moore Essex Green. Really all windows should be shuttered but that is expensive. Next step – If you want you can paint all the window sashes to match the green.